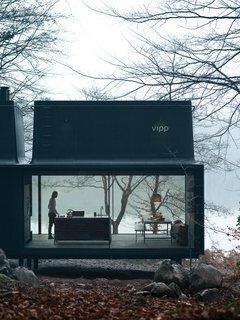 For 2015, Vipp, the Danish industrial design company known for its iconic trash cans and all-black kitchens, introduces a 592-square-foot prefab unit called Shelter. Vipp's prefab Shelter requires a delivery time of six months and costs $585,000. Pricing includes interior fittings, all by Vipp, including bathroom vanity, lighting, leather daybed, kitchen island, dining table (pictured), bedding, storage, and even kitchen utensils. Heating for the unit is provided by a Spartherm fireplace, with electric heating integrated into the magnesite floor. Walls are insulated with fire-tested wool felt under plywood panels. The bathroom includes a stainless steel-and-aluminum Vipp bath module with integrated sink, faucet, and Corian countertop; Vipp spot lamp; glass-walled shower with a complete set of Vipp bathroom accessories; towels; and a Duravit toilet. A Velux skylight above the sleeping loft includes remote-controlled integrated blinds. The prefab unit can sleep up to four people between the bed loft and the lower-level daybed. An adjustable ladder, which blends in with the walls in Vipp's signature ebony powder-coated steel, leads up to the sleeping loft. Vipp's prefab Shelter units are made in factory in Denmark with a six-month lead time. It takes three to five days to install a Vipp Shelter onsite. The layout for the 592-square-foot structure is open plan, with a sleeping loft above.